Reids Walk is a short stroll through a former alluvial gold mining area, when information panels are installed, they will provide a series of storyboards outlining the history of alluvial mining in the area. Meanwhile, pick up a map that outlines some of this information. You can access the walking track by taking MacKay Street (from near the centre of town), and then parking alongside the signposted walk start in McCoy Street. This leads down towards Reedy Creek, and then follows this waterway upstream to a suspension bridge over the creek. On the way, there is widespread evidence of the impact of alluvial gold mining on the local environment, as well as many opportunities to get down to the creek and take a dip. 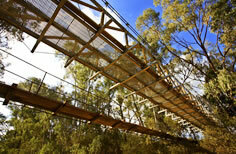 The walk finishes at the pedestrian suspension bridge, just short of the Wain’s Crossing. Walking distance is a little over a kilometre, with a similar distance back to the town centre via the road. The time taken overall is about 45 minutes.